Why try to reinvent the wheel when it works perfectly? Exactly. 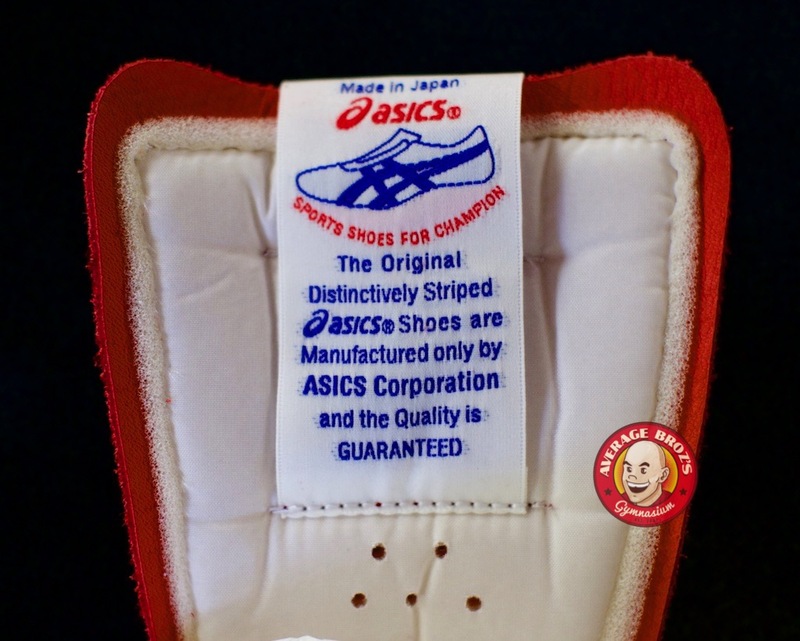 The Asics 727 Tiger weightlifting shoe has been, in every way, unchanged for over 30 years. Literally. The first generation were fabricated back when all shoe makers used leather, wood, and quality workmanship to assemble weightlifting shoes. In typical Japanese fashion they engineered a high-quality, well thought-out, and beautifully designed shoe. Over the years it never changed. Why? Because it was great and didn’t need improving. Numerous companies around the world also made weightlifting shoes. Over the years some of those manufacturers disappeared then reappeared like Reebok and Nike, while some completely vanished like Puma and Converse. The only large company that continued to make weightlifting shoes available for sale to the masses during this time was Adidas. Adidas was able to capture the majority of the weightlifting market by staying up with the times; every 2-4 years Adidas came out with new designs, new styles, even modern gizmos like crisscross plastic buckles and velcro straps. They even utilized unique fabrics like carbon fiber and kangaroo leather. Adidas evolved— constantly pushing the envelope to make a better shoe than their previous model, each time striving to make the best shoe possible for weightlifting performance and style. But did they? Did Adidas succeed, or did they lose sight of what a great shoe is supposed to be? After 35+ years of wearing weightlifting shoes and being Adidas’ biggest fan, I find myself perplexed. I now sit here with the 2014 Asics 727 Tiger in one hand, and a vintage 1979 Adidas Special in the other. 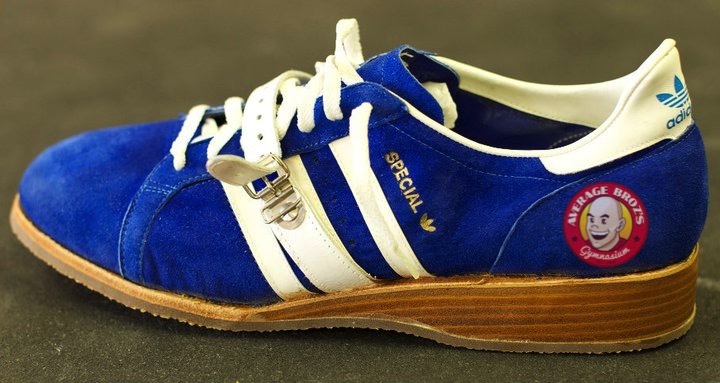 The ’79 Specials were made with a wood heel, suede upper, real rubber sole and a leather strap. These felt amazing from day one and lasted forever. The Asics and Adidas are so very similar to one another, nearly identical. So why did Adidas really change their shoe? Pursuit of perfection? Simple: Profit. Sell more shoes with a lower manufacturing cost. They didn’t care about making a great shoe, only about making money. Meanwhile, back in that small Japanese factory, Asics didn’t change a thing. They faithfully continued to make the identical shoe for decades with the original molds. The Asics 727 are assembled in a purpose-built factory where they are still made by hand, in limited quantities, 4 times per year. 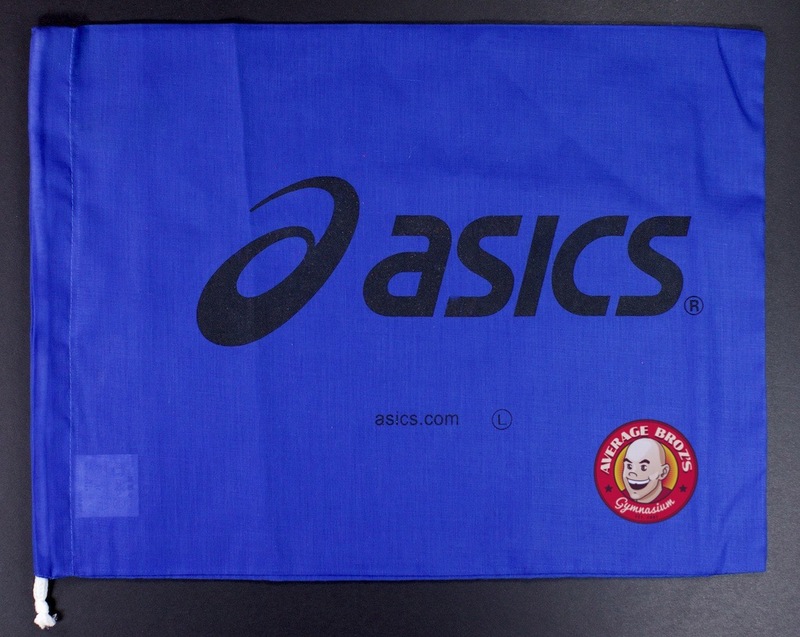 Because Asics have kept the same molds, factory, and system in place all these years are major aspect as to how they can continue to produce a high-quality product in the same method and remain profitable. 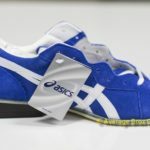 Some close friends of mine approached Asics Japan about potentially ramping up production so they could import large quantities to sell in the US market. 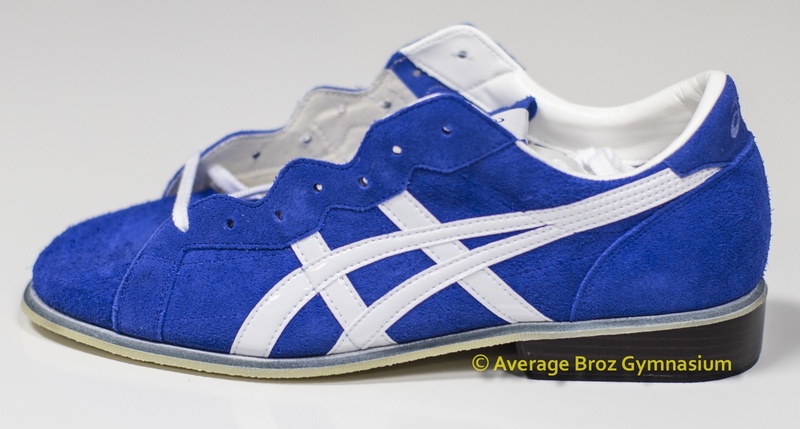 My friends felt, as I do, that the Asics 727 are the best weightlifting shoe in the world. Period. Unfortunately Asics Japan had zero interest. Even with 7 figures on the table, they paid no mind. Don’t change whats not broken. These hand-made shoes are assembled with pride. These are real shoes that come with a shoe bag for protection and storage. The rubber sole of the shoe is exceptional. 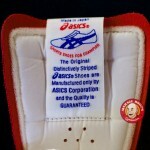 It has a great texture that keeps your foot firmly planted where you put it and the rubber is actually sewn on. Having a solid heel is how it should be— made of wood. The rubber sole on the wood heel is nailed on, identically as a high-end, quality dress shoe. The upper of the 727 Tiger is constructed of a reinforced, cloth-lined suede. Some areas of the suede are double-lined, like the inside of the toe box for added stability and strength. Due to the unique staggered lacing and the strong internal support, there is no need for a strap. These fit well and are extremely functional. The toe box is wider than the Nike Romaleos, which was a major area of complaint for that shoe. The strap which it doesn’t have is not at all missed. The suede is very soft with a nice brushed finish and beautiful classic appearance. The Asics 727 are extremely flexible in the forefoot area and give an immediate feeling of confidence and balance. Over the past four months we have received five pairs. I weighed them and was not surprised to find they are 10% lighter than the comparable size Adipowers. The weight difference between the left shoe and the right shoe on most was than less than 8g, but on one pair it was 17g. This margin was much larger than the Romaleos and I became more curious about this test. 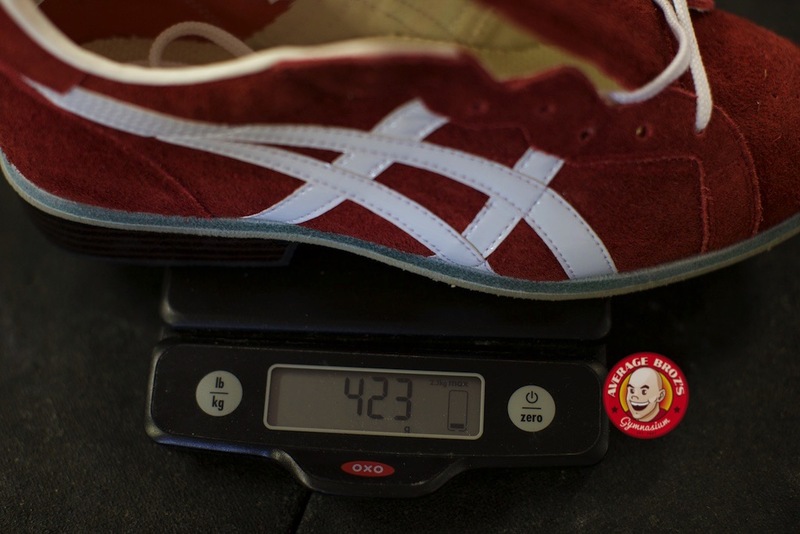 We have always weighed the lifting shoes individually to check for manufacturing consistency believing that the closer the better, so how were the tolerances of Nike’s so much better than Asics? Being in Las Vegas, I have accessibility to almost every high-end store in the world. Measuring used shoes would not yield consistent results, so I needed new shoes. Lots of expensive new shoes. So I went to numerous shops and weighed Italian, French, German, US and other very expensive, hand-made shoes to see how close their weights were. The results were surprising—not very. It seems that hand made shoes can vary extensively. It then made more sense. If a shoe was pumped out in a massive factory, made entirely of plastic at the rate of thousands per day, they should be relatively consistent —nearly perfect, while a hand made shoe will obviously have inconsistencies due to the various elements involved. The pitch, or angle of the shoe is ~7% which is nearly identical in both the Adidas and Nike. Even though the pitch and heel height are equivalent to the the Adipower and Romaleos, the Asics 727 feel significantly different. It isn’t in an actual measurement as it is strictly a feel. They feel more stable and easier to keep your balance. It could be the angle of the bottom of the heel, or possibly the width, maybe the suede material or a combination of all. Regardless, everyone felt more in control with them. Some things simply can’t be measured. 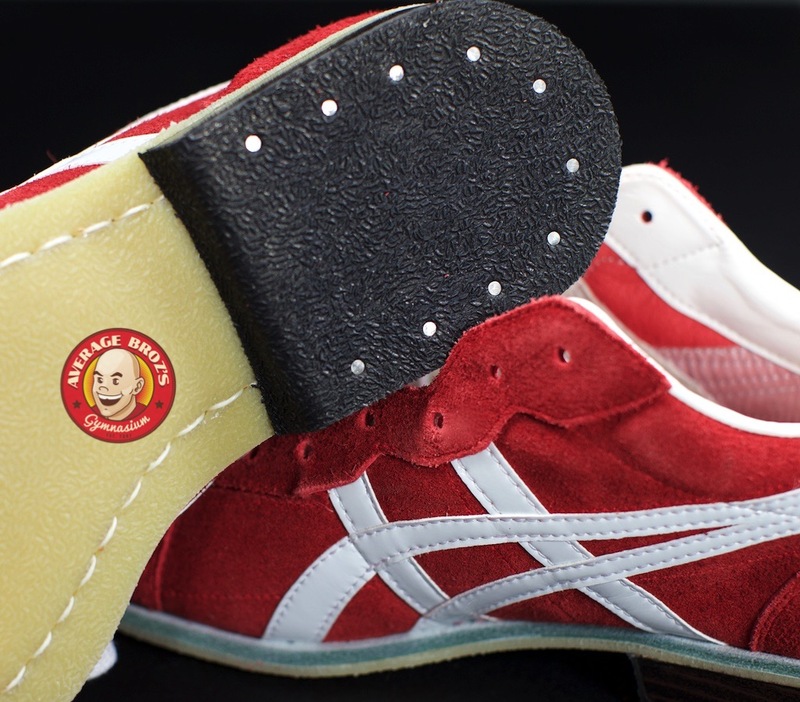 The Asics are produced in Japanese sizes 23 to 28. This is equivalent to US Men’s size 6.5 to 10. Subtract 1.5 for Women’s shoe sizing. 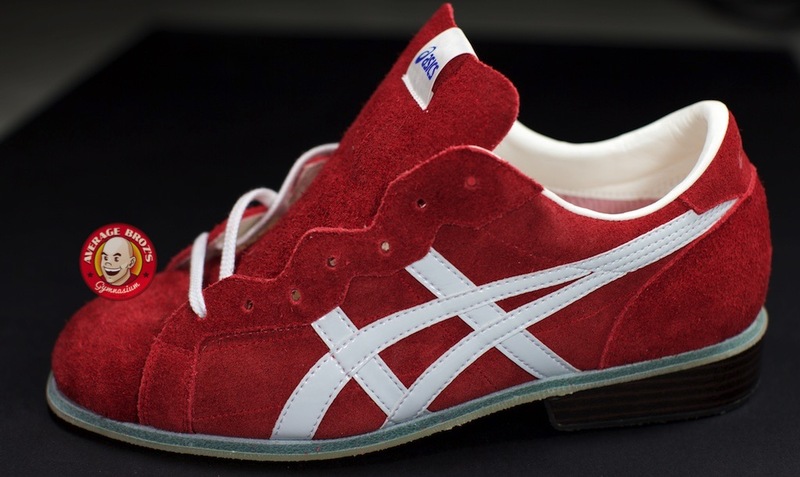 They are produced in either red or blue suede as standard. 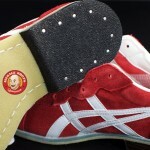 Interestingly, the Asics 727, since they are made by hand, can be custom ordered with personal touches. Unlike the Reebok, which can only be customized for color, the Asics 727 can be built with or without (+,-) 5mm on the heel in 1mm increments. Along with that, custom embroidery with your name or random text can be added. Multiple colors of uppers are available with different types of leather and not just suede. 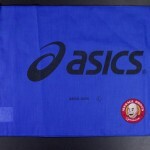 The Asics stripes and outline colors can also be customized. Exceeding the standard size 28 is also an option if you have larger feet. Unfortunately they will only go up to size 31, or US size 13. The downside for all this custom-made hotness is about $500 and a three month wait. If you are larger than size 13, then you are out of luck. Every lifter who wore the Asics 727 said the shoes felt extremely light and they didn’t need any breaking in. All lifters felt comfortable going to maximum on their lifts the first day wearing them. Three hit lifetime pr’s within the first two hours! Needless to say, the Asics didn’t have any negative effect on positions or hamper the feel for the barbell or balance over the previous shoes the lifters were familiar with. After 3-4 weeks the Asics broke in and felt even better. Two of the lifters literally threw their old shoes in the trash and said they would never wear a different lifting shoe. Ever. They are that good. How important is a wood heel? 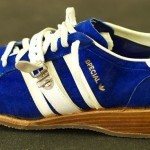 The outrageous price surge on used or NOS Adidas models with a wood heel vindicates the demand. But why? I spoke with Adidas High-Performance in Germany a few years back when the new 2012 Adipower was being released. Adidas described to me a heel density test that they perform on all new shoe designs. This test is to obtain scientific quantification of the hardness of a shoe’s heel for forces transmitted from the foot, through the shoe, and into the ground. The result is represented by a number that shows power loss through the absorption of the shoe’s constructed materials. A 1.0 would represent a perfect score for zero loss of force and zero absorption from the materials —ideal for a weightlifting shoe. Adidas’ testing of the wood heel used in the ’08 Adistar scored a .77 on their machines. The TMU plastic heel of the ’12 Adipower was rated .65. In contrast, the EVA sole on Adidas’ cross trainer was rated lower at .51. For this shoe, a softer heel was ideal because it was meant to absorb shock and be a hybrid lifting shoe. Adidas admitted the wood was a better material to transfer force for a high-performance weightlifting application such as this; however, it was too costly to continue its use in production. In the same breath the rep said the results between TMU plastic and the wood were so very close that the force loss was negligible. .12 is a sizable difference percentage-wise, and when you lift in the shoes, it’s painfully obvious. It’s not close. Not to mention the sound a wood heel makes when striking the platform mid-lift. It’s something no plastic shoe can reproduce. People ask me daily “How do the Asics compare to the Nike Romaleos 2’s or Adidas Adipowers?” The answer is simple. They don’t. It’s not fair to compare them to this shoe. It’s like comparing a Ford to a Ferrari. Ford builds capable, quality cars, but they don’t build the best hypercar in the world. One is built to provide adequate quality and decent function at an affordable price for the masses, while the other is custom built for discriminating people who have an eye for the finer things, appreciate quality in details, and desire a repairable shoe that can last forever. It’s a simple matter of quantity vs. quality. Watching videos of lifters over past decades and even into recent years, I’ve noticed numerous world and Olympic champions, world record holders, and some of the biggest names in the sport wearing the Asics 727’s including Dimas, Kakhiashvilli, Klokov, Botev, Leonidis, Kim Un Guk, and the list goes on and on. I have been lifting my entire life with no plans on quitting anytime soon. While spending $300-500 on a pair of lifting shoes might seem insane to some, for me it’s a no brainer. After wearing my 2012 Adipowers for the past two years I have grown to dislike them (see the long-term review). Almost every other lifting shoe on the market today is similar to Adidas with their plastic this, wedge that, patent this and velcro that. Whatever. I’m over it. After seeing these shoes in person and wearing my old Adidas again, I realized why change something that was never broken. I prefer fine leather, wood, and rubber being hand made by craftsmen who care. Asics stuck to the original plan, and I am happy they did because these are timeless and worth every penny. Does anyone know where j can grab a pair? We will be selling them in about 2 weeks. Great review. I’ll be in Japan this fall and will probably have to track down a pair, if I don’t order them sooner. Have your lifters who switched from Romaleos end up in equivalently sized 727s, or did they size up/down at all? They were all correct, but we measured just to be sure. 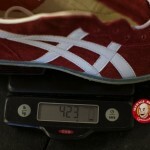 they are about the same, However the Asics are wider than the Nike’s so take that into consideration. Will you be carrying these anytime soon? We are working on trying to get 100+ pairs. Do you guys have a timeline of when you think you’ll be getting some pairs? Great review. Have you looked into or tried Risto Sports lifting shoes? I’ve had mine for almost 2 years now and I have enjoyed them. They make a variety of styles, and we had 1 pair 6 years ago before we began taking notes. Man, those ’79 Adidas Specials are sweet. I’ve come to the same conclusion. I’m done with the TPU Nike/Adidas atrocities. Going to get a pair of the Asics when they get restocked. If the ’08 Adistars got a 77 on their test, wonder what the older models would score? My C+J PR was done many moons ago in 2000 Adidas Equipment’s which fell apart years ago and I have missed them dearly since. Pairs in and would they be up for sale for the public? Where can we buy them now? Just to clarify about the sizing comparison, size 23 in Japan can be compared to size 6.5 in the United States? I ask because I thought size 24.5 in Japan is comparable to size 6.5 in the US? I may be wrong but I just wanted to make sure. 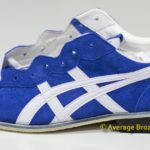 Question: In looking at the conversion chart I linked from Onitsuka’s US site (also here: http://goo.gl/nCDBnc), it states a 6.5 would be 25cm. Nike’s conversion chart agrees with this (I cross-referenced as my current lifters are Romaleos IIs). Of course we all want to get the right size the first try, so I’m worried whether a 6.5 US equates to a 24.5 or 25cm. The conversion chart on our store is accurate, however measuring is always best bet. I read the review and saw that the sizes only go up to 28cm. Just curious if the batch you’re getting in 2 weeks will have any “custom” sizes? For someone who is a 29cm in other Asics shoes I barely miss the mark. Anyway, thanks for the great review Broz and thanks for always being so hospitable at the gym. Great news that you’ll be stocking these. Rakunten still doesn’t have them in stock in my size. Will you ship to Canada? Is it difficult to put in a custom order? I wear a size 10.5 US and I guess I would have to custom order if I ever wanted a pair. best to measure your foot. The toe box is wide so a 28 might fit. 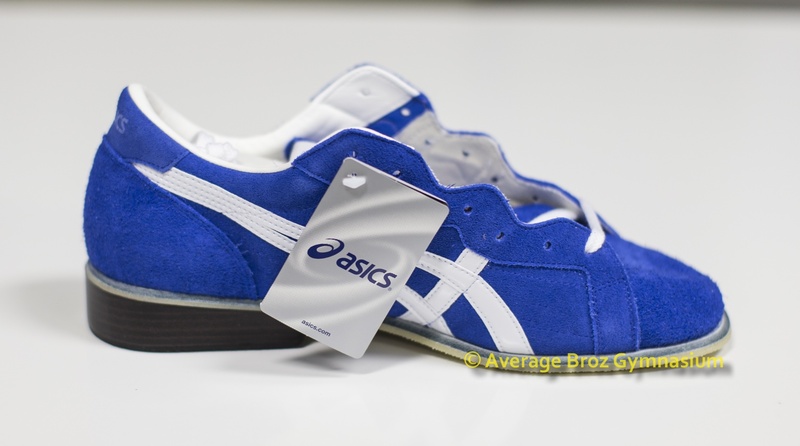 Do you know if the sizing is comparable to other asics shoes? Hoping to get a pair from the fall batch! Are you going to be restocking these shoes anytime soon? When will you be getting more? And how an I pre-order or be notified? The are being shipped and will be available next weekend. When are these shoes are going to be restock? Do you have a date for the next shipment, or a rough estimate of when that might be? They are in customs now and should arrive next week. Sorry to inquire for the ninth time… Are they still coming this week or are they held by customs Do you think they can still be received in US before the end of next week? Who do I contact for size 12 ? Will you be getting on any custom size 30cm(12’s) in on this shipment? Any update on when you will be receiving a shipment of the red Asics? Thanks. So it’s the 1st week of November , I guess I missed this round. I’ve been trying like hell to find & came across Average Broz as a reference. So when will these come around again & will they be in Japanese 28.5 or US 10.5 in Men’s in Blue. Will it be in January as i understand they only make them 4times a year. How do I go about getting them customized if needed. Is it as simple as contacting ASIC in US by email. I thought Comic Con tickets were hard to get lol!!! Asics US does not import these. They must be purchased from Asics Japan – who won’t sell to outside of Japan. 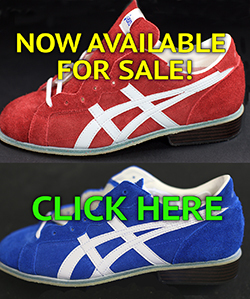 If you want a custom pair you need to contact a current vendor in Japan who can order for you. Process is 3-6 months and will cost $5-600. Also, even with custom sizing, 28.5 is not an option. only full sizes 29-31. I would try a pair of 28’s. The toe box is wide and good chance they will fit. that mean you need someone in japan to do the order? What is the biggest size that you receive in a shipment? For people with big feet (I’m a US12) is it possible to order a custom pair through you? If not where could one place a custom order? Biggest size is 28 (10-10.5) larger is custom that will be $550+. We don’t do custom orders. seen size 12 and 12.5 in the wild. how _DOES_ one manage that feat? I’d like to buy some Asics 727’s. Do you have any idea when you will have size 8.5 US back in stock? Let me know as soon as possible. Thank you! When do you expect to get some more of these in / any 27’s hiding in a closet somewhere that aren’t listed online? WE have both red and blue 27’s available. Do you know when you will be getting more of these shoes in stock? Thanks! In stock now. Inventory added weekly. Hi! When will the shoes be restocked? Also will I be able to ship it to Asia? Will you have size 25.5 jpn/ 7.5 US anytime soon? I am curious if you guys intend on doing a review of any risto shoes? The comments regarding wooden heels in this article caught my eye. I use adipowers presently. These asics sound wonderful, but my foot puts me in the $500+ range for a custom order, and I don’t know if I could do that now. there are too many styles of Risto’s to review and give a proper overall impression. We have had team members use a few different models of their shoes and all have converted to Asics. They are not made standard from Asics in size 28. Only in custom. IF you find a pair, play the lottery. You should measure your feet. Take the longest measurement and choose from there. What is the effective heel height? Hi, How long will it take to ship to Hawaii? Forgive me if I am misunderstanding. So if the heel height is equivalent to Romaleo and AdiPower, we’re working with the 0.75 inch number, yes? And we can customize +/- 5mm? So theoretically one could order a shoe with an effective heel height of ~.55 inch? Hi I wear a US 10.5 Inov8 335 which fits perfectly. How does the sizing of the asics compare, and do you think I’ll be able to fit into the size 28s? I have a pair of adidas power perfect 2 size us9- jp 27. Which size of these asics are for me? I’ve been wearing my Tigers for a couple of weeks now, and I’m wondering if you recommend using shoe trees while they’re not in use. Thanks. Yes. For all high quality shoes using cedar trees is always recommended. Are you able to give an approximate wait time for a 28 – the option isn’t listed on the sizes; am I safe to assume they are out of stock? The availability is unknown to us. We only receive what is currently available from the factory. Updated sizes, etc are done randomly as they arrive. When will 28’s be back in stock in either color? I’ve been looking out for a while now. 27.5 will not work. Thanks! I’m an 8 in Adipowers and a 7.5 in Romaleos. I measured both feet and they are both 25.5. Is the site up to date/ do you have any 25.5’s in stock? Will you have size 26.5 jpn anytime soon? Hey Broz, great review! I was wondering if I could get your advice on sizing: I followed the link on measuring and sizing correctly, which puts me at 28. However, both my lifting shoes (Sabo Deadlift and Strength Shop Coyote) are sized at 9, which comes in at 27. Should I be looking at size 28 or 27 for the Asics 727? My feet are pretty much a standard D width. How many inches was your largest foot, diagonally? Well, my longest toe is my second toe and the distance between it and the back of my heel is 27.4cm. The diagonal distance between my big toe and the back of my heel sits at 27.5cm. How do I go about ordering a pair bigger than JP size 28? I have a EU46. If you have narrow feet is it safe to go size down? If you go too small you feet will hit the inside of the toe box. I would recommend measuring your feet diagonally and buy the proper length. If they are too wide, then you can add an insole to absorb some of the width, but going shorter is not recommended. I see you have gotten some more in red. Any estimate when you will have more blue available? Waiting on the blue in 24.5. The January production and sizes for delivery have been confirmed and currently in route: 25,5-28 in both red and blue. The smaller sizes will likely be in the February manufacture schedule. How would you say the sizing is on this? I wear sz 11/29 cm in adipowers. I think if I order 28 cm I will be pushing it and will most likely go with a 28.5. Also how would you say the 0.5 mm heel feels? Does the height feel just right? Do you feel stable to the floor? I have tried 0.75 inch and a 1 inch heel. I’m 6’3 with horrible ankle mobility from injuries in the past. There is no size 28,5. Largest is 28. I would highly recommend tracing your foot and getting an accurate, real world measurement and not rely on sizing from another shoe. the heel height is not the important issue, but rather is the pitch. If you find a pair that fits and the heel is not high enough, good thing is they are real shoes and can be custom altered from a local cobbler. Thank you for your reply, I would be getting it custom ordered from Japan. You mention that pitch is more important. However in the review you say that it’s identical to the nike and adidas yet the asics are better. Could you explain? Here is my story. My largest foot measures at 25cm. All you have available is 24.5. My Innovate Lifters say 24.5cm on the tag and i also wear a 6.5 in old black suede Rogue Do-Wins… I wear thin socks and like my shoes snug. Do you think 24.5 will work for me? We currently have size 25 in route in both red and blue, so that is a choice. However if you like the way your innovate fit, and prefer a tight fit then the 24.5 should work because the Asics’ toe box is wider. If you get the 25’s, they will fit the long, but feel loose on the smaller foot. Hi, just wondering if you recommend size 27 or 27.5. I made a measurement using the tabi/jikatabi web page you linked to on the ordering page. I came up with 26cm (including the 0.5cm the link recommended adding). I currently wear Romaleos 2 in size 9.5 and they are comfortable, even though they feel slightly loose around the ankles. I also wear very thin ankle socks. Thanks. If you measured your foot and its 26 including a .5cm, then 26 would be the maximum size you should get. Typically size 8.5 US = 26.5, so I think you should remeasure if your normal shoes are 9,5’s and fit. When do you expect to have Red in 27cm back in stock? We get new stock all the time, so either check back or shoot us an email to: store@averaegbroz.com and in the subject line put the size and color needed and when they are in stock we will notify you! Hi there, my larger foot came out to be just past 11.5in or around 29.2-29.3. Would you recommend going with size 29 or 30? I know I would have to custom order through a different website so any info is appreciated, thanks. I would go with the 29 and if they are a bit tight, you can possibly have them stretched by an experienced cobbler. 30 is the size I ordered and I wear a 12-5-13 and they fit decent. Thanks for the quick response. Do you happen to know any websites that would do this custom order? Again, thank you for the help. Sorry for the barrage but would you say the 30 fits snug for your size foot? I wear an 11.5 in Adipower that fit quite tight and wouldn’t like smaller than that. Debating whether to go 30 and wear a thicker sock. Thanks again. They are not snug at all. I actually added an insole so they fit better. I wear a 12.5 -13 in Adidas. Alright I’ll go with the 29 then, thanks for the help. Do you have any information on what the source of the leather used is? ie. pig skin, calf, water buffalo? Hi, I have a Romaleos 2 size 7.5 and they are perfect. What exactly is the size of the correspondent in Asics 727 tiger, 25 or 25.5? Its so hard to justify the price now. As much as I want to buy these and get rid of my adipowers, the price accumulates to 3 pairs of tpu based lifters. I understand they are hard to come across, but thats just not feasible for me.